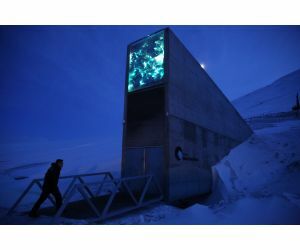 Over 1 million unique crop varieties now held in Seed Vault. The Svalbard Global Seed Vault. 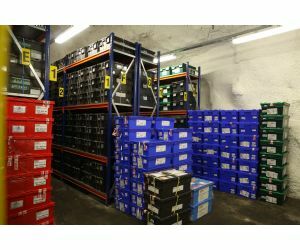 The Svalbard Global Seed Vault has celebrated its tenth anniversary by receiving shipments of more than 70,000 crop varieties from storage facilities in Norway. The deposits have taken the total amount of unique varieties of crops received by the Seed Vault in the last decade to more than 1 million. Depositors from seed banks around the world have faced sub-zero temperatures to deliver duplicate seeds of staple foods such as rice, wheat and corn to the Vault, located inside an icy mountain in the Svalbard archipelago. Other important crops have been deposited, such as the black-eyed pea (cowpea), an important source of protein in Africa and South Asia, along with samples of sorghum, pearl millet and pigeon pea. Several lesser-known crops have also made the trip to the Vault. These include the Bambara peanut, which is being developed as a drought-tolerant crop in some parts of Africa, and the unusually called Estonian onion potato, which has been deposited along with unique bean varieties in the eastern European country. This event has involved the simultaneous deposit of the largest number of institutions (23) to date. "The Svalbard Global Seed Vault is an iconic reminder of the remarkable conservation effort being carried out every day, all over the world and throughout the day, an effort to conserve the seeds of our food crops," said Marie. Do, Executive Director of the Crop Trust. "Safeguarding such a large range of seeds means that scientists will have the best chance of developing nutritious and climate-resilient crops that can ensure that future generations not only survive, but thrive." The Svalbard Global Seed Vault opened its doors for the first time in February 2008, as a backup facility for the world's seed banks. It received deposits of more than 300,000 different types of seeds in its first year and deliveries have continued several times a year since then, from countries far and wide, including Australia, Burundi, Colombia, Germany, India, Japan, North Korea , Russia, USA UU and many others. 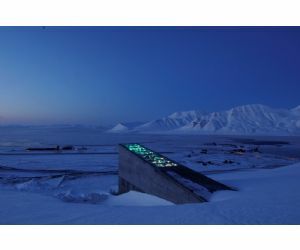 "The tenth anniversary is an important milestone for the Svalbard Global Seed Vault," said Jon Georg Dale, Minister of Agriculture of the Norwegian government, who jointly manages the facilities with Crop Trust and the Nordic Genetic Resource Center (NordGen). "It comes at a time when agriculture faces multiple challenges because of extreme weather and the demands of a world population that is expected to reach 10 billion people by 2050. This means that it is more important than ever to secure the seeds, the the basis of our food supply and the future of our agriculture, are preserved safely. " During the decade-long history of the Vault, only one institution has withdrawn seeds: the International Center for Agricultural Research in Dry Areas (ICARDA), whose own seed bank in Syria could not operate due to a civil conflict. In 2015 and 2017, ICARDA requested some of its deposits of wheat, lentils, chickpeas and other crops in order to re-establish its research and conservation work at sites in Lebanon and Morocco. Since then, he has managed to duplicate and return thousands of these varieties to Svalbard. For that reason, as of today, the total number of unique crop varieties in the Seed Vault stands at 967,216. The total received by Seed Vault - excluding withdrawals - is 1,059,646. In 2017, work began on the outside of the access tunnel of the Seed Vault to make it watertight and prepare it for the possibility of a warmer and more humid future. The seeds continue to be safe, and the Seed Vault remains the safest seed storage facility in the world. The Svalbard Global Seed Vault's entrance. Some Boxes From 2018 Deposit.